Connor McDavid made hockey look fun. Canada made it look easy. 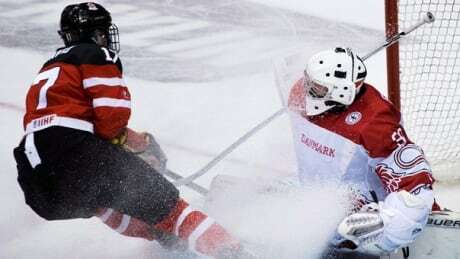 McDavid had a goal and two assists and captain Curtis Lazar scored twice as Canada blew out Denmark 8-0 Friday night at Air Canada Centre in the quarter-finals of the world junior championship. It was a show of force from the undefeated Canadians, who advance to play Slovakia in the semifinal Sunday. "It was too much for us to face in Canada with their speed and physicality," Danish coach Olaf Eller said. "We faced an amazing team, which, with their speed and extremely quick transition game, killed us." McDavid earned player of the game honours and deservedly so. The projected No. 1 pick dazzled in his first game at Air Canada Centre, recording one assist falling down, scoring a goal by deking the goalie out of the net and picking up another assist by turning a defenceman inside out. Lazar, his right-winger, said sometimes he gets wowed by McDavid and has to catch himself. Teammates on the bench get to enjoy more of the 17-year-old's play. "We're all starstruck just like the fans," winger Anthony Duclair said. "He's a great player and he's got unbelievable skill." McDavid now has two goals and seven assists through five games at the world juniors. "He's been our best player the whole tournament," winger Max Domi said. "Sometimes the puck goes in for him, sometimes it doesn't. Tonight it went in." It went in a lot for Canada. In addition to McDavid and Lazar, Canada got goals from Sam Reinhart, Lawson Crouse, Nick Paul, Brayden Point and Nick Ritchie. Depth of scoring was again evident, just as it was in the tournament-opening blowout of Slovakia. "It's huge," said Lazar. "To get contributions from guys: Ritchie, Crouse, Paul, etc., that's big for us especially we're getting down to playing for keeps. ... We need to get all guys going and firing on all cylinders." Canada was firing on all cylinders Friday night from the first shift, when the top line of Domi, Reinhart and Duclair hemmed Denmark in its own end. That was a preview of things to come. By the time the night was over, Canada outshot Denmark 50-14. The result would have been even more lopsided had Danish goaltender Georg Sorensen not made a handful of memorable stops. But the plays the 18,448 fans in attendance and those watching on television will remember mostly belong to McDavid. On Lazar's goal to open the scoring, McDavid drove to the net and around it and kept his head up as he was falling to the ice. Mid-slide, McDavid found Lazar in front, and the 19-year-old Ottawa Senators forward beat Sorensen short side. "It's good that he was there I guess," McDavid said.